'That heavy and doleful tragedy which is commonly called the Powder Treason'. Sir Edward Coke, prosecuting counsel at the trial of the plotters. On the night of 4 November 1605, the earl of Suffolk, lord chamberlain of the household of James I, led a search of the maze of cellars and basements that lay under the House of Lords in the Palace of Westminster. Here the search party discovered a man claiming to be John Johnson, a manservant standing guard over his master's winter fuel supply. In fact, Johnson was a professional soldier and explosives expert named Guy (or Guido) Fawkes, and the casks and wood faggots he was guarding concealed thirty-six barrels of gunpowder. 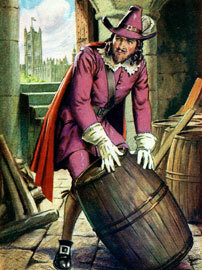 Fawkes' mission had been to blow up the Houses of Parliament where, the next day, James I – accompanied by his queen, Anne of Denmark, and heir, Henry, prince of Wales – was to open the new session. A handful of men had threatened to change the course of history. Why didn't the plot succeed? Central to the plans of the plotters – led by Robert Catesby – was the kidnapping of James I's nine year-old daughter, Princess Elizabeth, who was housed at Coombe Abbey near Coventry, under the guardianship of Lord and Lady Harington. The plotters planned to declare Elizabeth queen, raise her as a Catholic and secure her marriage to a Catholic bridegroom. But the conspirators were ignorant of the fact that Elizabeth had no Catholic sympathies. As an adult, she was to become and remain a staunch Protestant. Elizabeth's youth also required the plotters to appoint a protector to govern in her name. Here they were equally misguided. The plotters knew that, if their plans succeeded, chaos would immediately engulf England. Order would have to be restored and, with it, the Catholic faith. The appointment of a protector would be essential, to rule in the name of the puppet Queen Elizabeth. There was one obvious candidate – the powerful and influential earl of Northumberland, a Catholic sympathiser. One of the conspirators, Thomas Percy, was his kinsman and employee. But the plotters made no effort via Thomas Percy to persuade Northumberland not to attend the opening of parliament. Nor did Northumberland's behaviour in early November suggest that he had any inkling of their intentions. The conclusion must be that the conspirators 'left all at random'. They would wait to see who survived the blast. 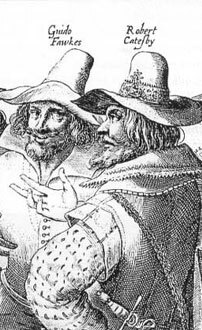 Francis Tresham was the plotter on whom the mastermind of the Gunpowder Plot, Robert Catesby, had to work the hardest. Tresham asked Catesby a question: if parliament were to be blown up, what would Catholics do afterwards – 'What strength are they of themselves?'. Tresham also argued that there was no foreign power to back the vulnerable Catholic minority against a Protestant backlash – in August 1605, Spain had signed a treaty with England, ending years of debilitating fighting. Catesby answered simply: 'It must be done'. Parliament had originally been scheduled to meet on 3 October 1605, but the tail-end of an epidemic of bubonic plague in London caused the event to be postponed for a month. Although Northumberland was not warned of imminent danger, during the extra month's delay another member of the House of Lords, Lord Monteagle, a closet Catholic, did receive a fateful letter that remains the subject of enduring controversy. Monteagle was married to Robert Catesby's first cousin, Elizabeth Tresham. On 26 October, he was handed an anonymous letter which had been delivered to one of his servants by a mysterious stranger. It urged Monteagle to 'retire yourself into the country for... they shall receive a terrible blow this parliament and yet they shall not see who hurts them'. By his own account, Monteagle immediately took the letter to James I's spymaster, Robert Cecil, earl of Salisbury. On Friday 1 November, Cecil showed it to his royal master, who had been away on a hunting trip. The following day, the decision was taken to search the Houses of Parliament 'above and below' – but two more days passed before this was done. After the discovery of the plot, Monteagle received land and a pension worth £500 a year. Who wrote the Monteagle letter? The balance of opinion is that it was a concocted document, but we will never know exactly by whom. It was truly a 'dark and doubtful' communication, possibly fabricated by Monteagle himself with the connivance of Cecil. Certainly Cecil's leisurely approach to interpreting its meaning and showing it to the king suggest his complicity. The plot was real enough, but what was happening behind the scenes as Cecil's intelligence machine moved into action? The Monteagle letter, whatever its origin, doomed the plotters to discovery. Francis Tresham's doubts proved well founded. After the discovery of the plot, Catesby, Thomas Winter, and seven companions fled to the Midlands where they had intended to raise the flag of revolt with a troop of cavalry. During their progress, they received no support from fellow Catholics, despite their repeated claim that the king was dead. A posse led by the sheriff of Worcestershire – and raised with suspicious speed – tracked the conspirators' dwindling band to Holbeach House in Staffordshire. 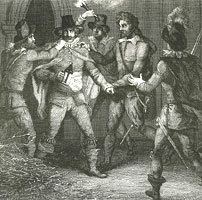 In a fire-fight, Catesby and three other conspirators were killed. The remaining plotters were taken to London and, after a show trial, they were condemned to death and executed. 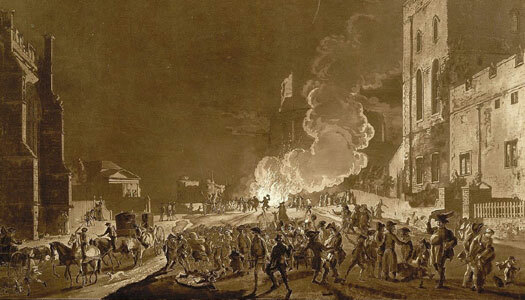 Even if the plot had not been discovered and the stockpile of gunpowder had remained untouched beneath the House of Lords, it is highly unlikely that the promised explosion would have occurred. By November, Guido Fawkes' gunpowder would have 'decayed' from having been left too long and, in all probability, would have been ineffective.